Sign by Ax, mid-18th century, Magnificient Faience delft round dish A magnificent and rare delft faience plate, hand painted in a blue cameo, depicting peonies. Our plate signed on the backside in blue with the sign of the manufacture Ax, under Justus Brouwer (1739-1775). The Ax factory was founded in 1657 and produced until 1803. Beautiful Dutch work, mid-17th century by the earthenware delft factories, circa 1740-1760. Dimension: Diameter 13.77 in. Excellent original condition, with little scratches. Excellent original condition, with little scratches. Beautiful set of five delft vases, three with lids. The markings indicate the manufacturer as The Old Moors Head. Pair of jumbo 18th century delft blue and white chargers. 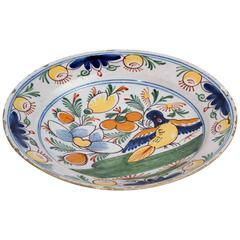 Colorful delft polychrome platter with a bird, 18th century, Dutch. Delft Charger from the 18th century. 18th century delft charger. Possibly From Frankfort, circa 1720.